Salutations FM Trendsetters and FM Hip Hop Heads! On another episode of “This Is The Music Industry“, we find our hero, the young Lil Uzi Vert caught in literally a “tug of war” with his Philly-based Generation Now label (DJ Drama and Don Cannon) and new management company (but hopefully future label) Roc Nation (Jay-Z, Biggs, OG Juan, Emory, etc.). Lil Uzi Vert has been having issues with the Generation Now label in the past and currently. Consequently, the Philly rapper’s expressed issues have taken its toll and leaked upon social media and the internet. Following the release of his “Free Uzi” track, which received millions of views on all platforms, fans and fellow artists, producers, and others in the music industry expressed their support for the “XO Tour Llif3” rapper, ironically posting hashtags “Free Uzi“. The major attention caught up to the desk of the office of Jay-Z and Roc Nation. This is not the first rodeo the label been in regarding the emancipation of artists out of their contracts. Jigga did the same for Lil Wayne on a prior occasion, concerning his release from Cash Money. However it seems like the grasp of Generation Now is getting tighter than a boa constrictor and the tape is getting thicker. 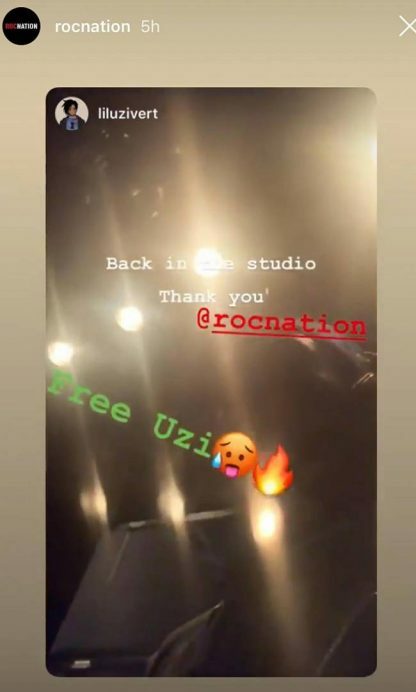 Despite Lil Uzi Vert posting on his Instagram story of him working in the studio, tagging Roc Nation and hinting at new music under the new management, Generation Now is not letting their artist go without a fight. Legally that is. However with every contract there is loopholes.